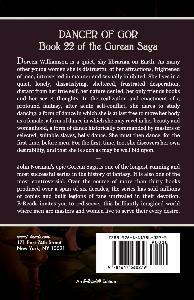 Doreen Williamson is a quiet, shy librarian on Earth. As many other young women she is distrustful of her attractions, frightened of men, introverted in manner and sexually inhibited. She lives in a quiet, lonely, dissatisfying, sheltered, frustrated desperation, distant from her true self, her nature denied, her only friends books and her secret thoughts. In the realization and enactment of a profound fantasy, after acute self-conflict, she dares to study dancing, a form of dance in which she is at last free to move her body as a female, a form of dance in which she may revel in her beauty and womanhood, a form of dance historically commanded by masters of selected, suitable slaves, belly dance. She must then dance, for the first time, before men. For the first, time, too, she discovers her own desirability, and that she is such as may be well bid upon.